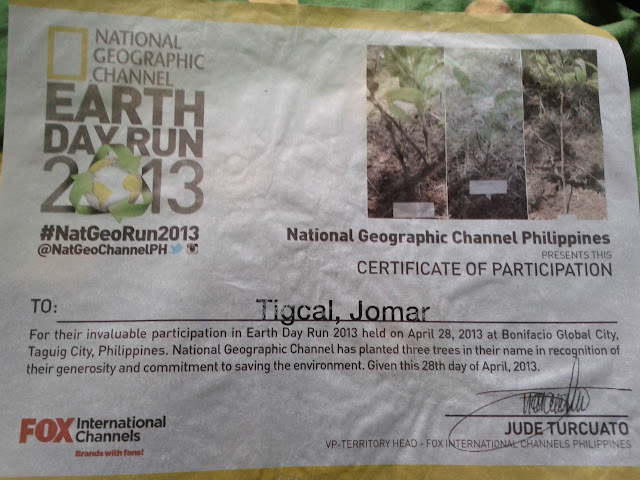 Last April 28, I was one of the thousands of runners who joined in NatGeo Earth Day Run 2013. If you haven't heard about it, this was the Earth Day Run last year whose picture of the trash left after the event went viral. Despite its last year's run's bad reviews online, I put my faith into it, especially after reading up that they made improvements now. Before the run, I asked @NatGeoChannelPh where the assembly/activity area will be because their website does not say and their maps ain't good. Instead of a good reply, they just gave me maps, which fortunately, was better than the one in their website. I believe it should have been explicitly stated in their website. Other runs do this and they also had maps or instructions on how to go there. In the first few meters of the 10k route, there was a small U-Turn slot and there were thousands of runners going to u-turn there. The result? A big confusion! Runners who are going to the u-turn slots and those who use turned are literally on the same side and you can't run properly. There were too many runners who ran at the same time. They should have just set up waves so runners won't have to be crowded on the roads. The kilometer marks were confusing! They should have labeled them properly if it was for 21k or 10k. I don't think it's a good idea to run with half of the side of the road with vehicles. They should have just closed the entire side for runners or chose a better route. There are also areas in the route that you have to stop to allow vehicles to cross first before you can cross. For real? Runs like this shouldn't stop runners from running except when they chose to (to stop for hydration or to rest or whatever reason). It's a terrible idea to have your own water bottle and have them refilled in the hydration stations. There were only a few persons assigned in the stations and refilling is done for each runner from liter-sized bottles. Considering there's a lot of runners running to the stations and it would be hard to refill, it's no wonder some runners just continued to run and did not stop for hydration. Also, they said they won't be having plastic nor paper cups but in the first hydration stations, there were paper cups and less trash bins. So there's still cups everywhere on the road; it's just not as worse as last year though. After crossing the finish line, there's a tent for hydration and you have to exchange a stub from your bib for a single bottle of drink. Imagine a runner is craving for water and will find too many runners in line (actually there was no line!) for the hydration. There was only one person getting the stubs and giving the bottles and he's serving the thousands of runners who will cross the finish line. In one scene, the table in front of the tent collapsed due to people eager to get the drink. If the hydration tent was bad enough, the baggage tent was worse. It took me around the same or more time to get my own bag than the time I actually ran! The baggage tent was so disorganized and people are literally shouting just to get their stuff. There was almost a stampede. And some runners already went inside the booth. Of course, a lot of runners reacted especially since the assigned persons didn't look at the stuff hose runners are getting to verify. I also hate it that these booths vandalize the bib by writing notes on them as marks for them. I don't feel that the amount I paid for in the registration was worth it.